The Advansafix III SICT from Britax is designed for growing children, from 9kg up to 36kg. The 5-point harness safely secures small children up to 18kg in car seat. For larger children, who are secured with the car's 3-point seat belt, the SecureGuard provides an additional 4th contact point keeping the lap belt at the correct position. The seat also features removable SICT for additional side impact protection. What's also unique are the multiple recline positions for all ages up to 36 kg. Advanced safety and comfort for your growing child. Designed to keep your child safe from 9 months all the way up to 12 years of age, ADVANSAFIX III SICT combines a range of advanced safety technologies that exceed the legal requirements to give you even greater peace of mind. ISOFIX with Pivot Link minimises forward movement in the event of a collision, reducing the risk of head and neck injury for children of all ages, while our side impact protection (SICT) provides additional protection in the event of a side collision. And as your child grows and transitions from being secured with the integrated 5-point harness to being secured with the car’s 3-point seat belt, the SecureGuard helps to keep the adult lap belt in the optimal position. The ADVANSAFIX III SICT grows with your child as it can be used for children from 9 kg to 36 kg. This makes it the only car seat you’ll need after an infant carrier. As your little one grows, you can easily switch from the integral harness (up to 18 kg) to using the car’s 3-point seat belt (up to 36 kg) with the additional protection from our SecureGuard to secure the child in the seat. Whether you’re popping to the shops or driving on holiday, your child’s comfort is essential for relaxed car journeys. As they grow, so their needs change. No matter how old they are, whether its 9 months or 12 years, ADVANSAFIX III SICT adapts to suit to your child’s specific needs. Approved for use in reclined positions for children of all ages, its soft padded side wings and adjustable recline positions mean you can be sure your child will be comfortable while travelling, wherever your journey takes you. Britax highback boosters protect your child in 3 ways: the seat shell provides head to hip protection for your child, epsecially in case of a side impact, the upper and lower belt guides provide correct positioning of the seat belt, and the padded headrest provides safety and comfort for your child's head and neck. Britax believe a 5-point harness is the safest way to secure your child in a car seat because it keeps them safe and tight in the seat's protective shell. In case of a collision, the harness distribute the forces of the impact across 5 points, two at the shoulders, two at the hips and one where the harness buckles between the legs. This helps to protect your child from all directions of impact. SecureGuard helps to protect an older child’s delicate abdominal area and adds an extra - a 4th - contact point to the standard 3-point adult seat belt. By keeping the lap belt in an optimal position over your child’s pelvic bones, SecureGuard helps reduce abdominal forces in the event of a frontal collision by up to 35 %* and at the same time allows your child freedom of movement during any journey. SICT offers superior protection to your child in the event of a side collision. It reduces impact forces by minimising the distance between the car and the car seat and deforms to absorb the energy before it reaches your little one. To benefit from the protection, simply adapt the SICT on the side of the car seat closest to the door. Keeping your little ones comfortable while traveling is a must. That’s why ADVANSAFIX III SICT was designed with 3 positions that you can recline with ease. Due to its twin anchorage points, V-Tether offers even greater stability and security for your child than a seat with conventional top tethers. The V-Tether prevents the seat from rotating and reduces the forward movement of the child in the event of a collision. Plus, its unique pattern of stitches is designed to progressively rip in a controlled fashion, absorbing the force of the frontal impact. In case of an impact, our patented Pivot Link System directs the force first downward, into the vehicle seat, and then forward, more gently - greatly reducing the risk of head and neck injury. Our performance chest pads provide comfort and reduce your child’s forward movement in a frontal collision with extra care and attention to a child’s delicate neck. They also help spread the forces from a frontal impact more evenly across your child’s shoulders and chest. 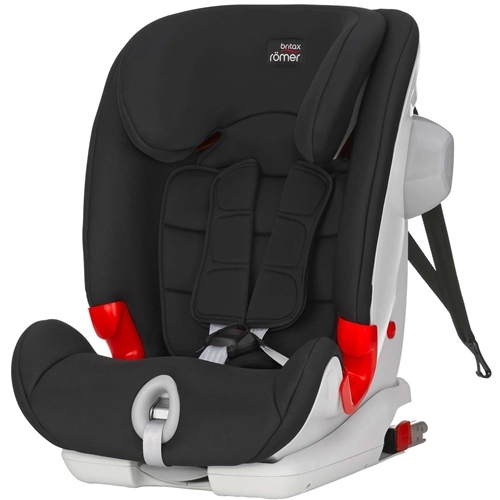 The padded headrest and harness can easily be adjusted with one hand to suit your child’s height. Before you install the seat in your car, check to make sure the headrest is in the correct position – just above your child’s shoulders. The easy-to-adjust headrest was designed especially for older children, when using the 3-point seat belt to secure them in the car seat. The headrest can easily be adjusted to the correct position, just above the child’s shoulders, with one hand - even while the child is sitting in the seat. Things can get pretty messy on the road. Drinks can spill and children can get car sick. That’s why Britax designed a machine washable seat cover that can easily be taken off without removing the harness, so you can clean up quick and get on your way.